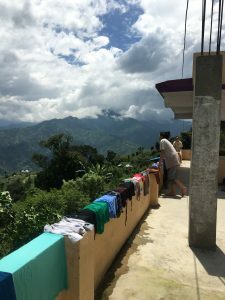 As we on Team Nepal near the end of our service trip, I reflect on our daily activities here and the lifestyle we’ve grown well-acquainted to. At Her Farm, I’ve come to find that we do not have a just one project or mission here as foreign volunteers, which I appreciate because it allows us the opportunity to integrate ourselves within the community and work alongside the resilient women here in what would be their typical Nepali day. Our days are inconsistent; every new day brings about a new adventure that demonstrates various facets of village life such as farming, cooking, paving roads and hiking miles for groceries. I’ve also come to find that the Nepali culture heavily emphasizes relaxation time and water breaks rather than full 8-hour work days. Despite common notions, the lessened focus on 8-hour days actually allows for maximum productivity and stronger communal ties. Typically in the morning, we wake up at the same as the women and children around 6:30 a.m. in order to help prepare breakfast. Because every traditional Nepali meal always consist of rice and curry, we spend around an hour preparing ingredients such as peeling garlic and potatoes, cutting onions and slicing green beans. Shortly thereafter, we have a “pre-breakfast” consisting of tea and biscuits — so yummy! Around 8 a.m., the volunteers will help the children with homework and English until breakfast time. After breakfast, we are then given a task that typically requires manual labor for the rest of the morning. This will vary depending on the needs of the day. For instance, one day we helped mend a large gap in the road caused by heavy monsoon rain. We shoveled dirt and rocks into the hole in order to improve village transportation. On another day, we helped harvest corn by hacking down the corn fields and we planted millet in its place. Through these activities I was able to learn valuable agriculture techniques and how the community water drainage and transportation system works! We then have lunch and our afternoon milk tea, and take time to ourselves before our afternoon itinerary, which usually consists of Nepali cultural lessons from the women who run the farm. During this time, we’ve truly been enlightened with a variety of lifelong skills by immersing ourselves into a different lifestyle such as alternative herbal medicine or acupuncture. The founder of Her Farm, Sunita, taught us about the various health benefits and usages of specific plants and how to find pressure points around the body to alleviate pain. Some volunteers even participated in acupuncture demonstrations as we learned that this form of medicine is more common in Nepal than seeking prescription drugs. In America, abuse of prescription drugs and costly medical bills have become incredibly debilitating issues. By learning alternative medicine techniques, perhaps we can circumvent this problem by approaching more natural methods that have been proven to work for ages. Afterwards, the volunteers have some free time and can choose between hand washing laundry, playing with the children or helping milk the cows and cook dinner. Whether it’s through cooking or during our downtime, we always have the opportunity to interact with the women here and inquire about their lifestyle, history and passions. It has truly been an honor to understand every one of our “sisters”, as they say, on a more visceral and personal level instead of feeling like an outsider who needs to be served. Around 7 p.m., we have dinner, which usually consists of rice, curry, prawn chips and vegetable soup. Afterwards, we usually join everyone in the community center for Nepali music and dancing! We get to experience how they enjoy their free time without mass technology and end our day with wholesome bonding and laughs with all of the women. It is pretty extraordinary to watch the exchange of culture in artistic form such as music and dance. For two weeks, we even decided to learn and practice traditional Nepali dance choreography every night to perform it for the whole farm. Around, 10 p.m., we are asleep to start a bright and early day all over again. Living on the farm has taught me how to sustain a minimalist lifestyle with an emphasis on recycling material, using natural resources and consuming fewer man-made goods. While it is a far different lifestyle from that of my privileged bubble in Irvine, I am learning to appreciate how living on a farm on a mountain has forced me to recognize pollution more intimately and what simple behaviors I can change to protect our earth. For instance, instead of using toilet paper, we use handheld bidets (which is actually more sanitary for us!). All plastic materials are transformed into household items such as scrubbers, book covers, or utensil holders. Even our wasted food is utilized as livestock meal! While we may think our Western lifestyle is more efficient or expedient, Nepal has got it right when considering sustainability and protecting Mother Earth.